In a previous post on the Batangas Port, I featured the newer passenger terminal for fast crafts or fast ferries and large outriggers (katig). This time, I am writing about the Roll-On, Roll-Off (RORO) passenger terminal just across the road from the fast ferry terminal. Heading to Calapan for a meeting there, we were disappointed that we could not take a fast ferry (i.e., SuperCat) to Mindoro. SuperCat ticketing staff informed us that fast ferry services were suspended due to rough seas between Batangas and Calapan. And so to be able to make our appointment, we had to take the slow ferry, which is actually a RORO ferry to Mindoro. Passengers can purchase their tickets from one of the booths just beside the terminal. Various shipping lines provide services between Batangas and the islands of Mindoro and Romblon. Schedules and fares of ferry services are posted on the windows of each shipping lines’ booth. Montenegro Lines operates the most frequent RORO ferry trips between Batangas and Mindoro. RORO ferries leave Batangas every hour for destinations in Mindoro and there is a 24-hour service between Batangas and Calapan. We paid PhP195.00 for a one-way trip to Calapan, Oriental Mindoro. Waiting area outside the terminal, which can become very crowded during holidays. One passes by this area right after paying the terminal fee (PhP 30.00) prior to entering the terminal building. Convenience store at the ground floor inside the passenger terminal. At the ground floor are several other eateries where passengers can purchase and eat meals before boarding a vessel. The passenger terminal had clean restrooms at the time we were there. I just hope these restrooms are of similar conditions during the peak periods of travel. View from across the passenger terminal showing berths for large outriggers (katig) that people can opt to take between Batangas and Mindoro. These are popular for people heading to the resort town of Puerto Galera. These rides can be quite bumpy (and dangerous) so there are concerns regarding safety. Seats and shops inside the passenger terminal. On the right is a passenger having a pedicure inside the terminal. My companion was asking me about the women who were carrying small chairs around. Upon observation, we found that the answer was that these chairs were used by women offering manicures and pedicures to waiting passengers. The waiting area is located at the second level of the terminal. Passengers can get snacks and souvenirs from the small shops at the terminal waiting area. When boarding was announced, people filed out of the waiting area to walk across towards the pier. There is a walkway connecting the terminal to the pier. Passengers descend the walkway towards the ferry we were to board. Shown in the photo are people walking past trucks waiting to board the RORO ferries. While many passengers travel light, there are some who probably had a lot of luggage because they were coming from longer trips (e.g., flew in from abroad) or maybe taking a long vacation. Fellow passengers walking towards our ferry to Calapan. Given the popularity of internet sources among researchers (especially the less experienced ones) these days, there is a tendency for many to rely on online resources rather than put some effort to browse actual libraries for references such as hard copies of books and journals. Research supervisors usually allow this for cases when the online resource happens to be electronic or digital versions of published material. There are both formal and informal sources online for such published material including online versions of journals managed by reputable publishers like SpringerOpen and Science Direct and websites by researchers and research centers themselves like the Victoria Transport Policy Institute. These are rich sources of refereed/reviewed material that are highly recommended for any literature review that students and researchers need to do before embarking on any serious work. Nowadays, however, there have been a lot of other material found online including those on blogs, YouTube video, Twitter, Facebook and email that have been gaining acceptance as valid references. For example, it is possible that an interview may be conducted through an exchange of emails or via the chat features of Facebook. Lectures or talks like the popular can be found on YouTube or at TED. As such, these materials should be cited properly in research work. 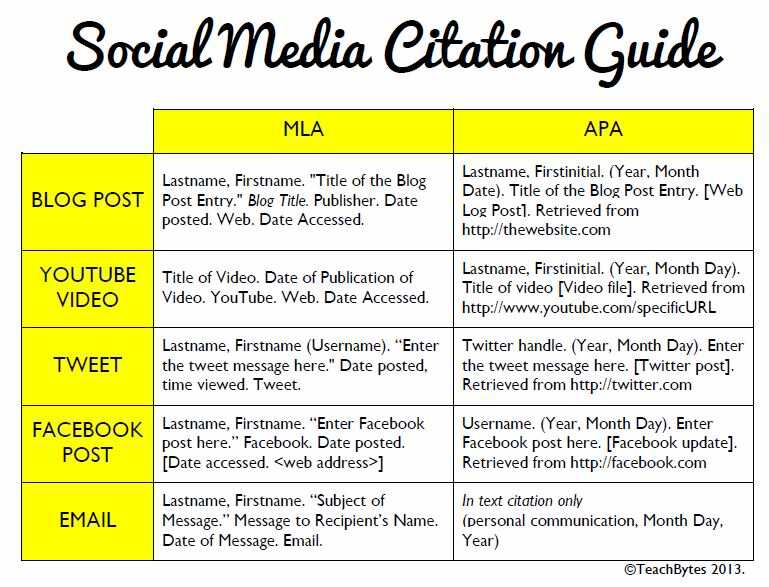 Obviously, I deliberately posted this material on proper citations here to remind people using or intending to use material from my posts in their research or other purposes. It is also quite timely considering the news featuring a plagiarist (i.e., a person passing off someone else’s work as their own). The establishment of an ITS society in the Philippines is an idea that’s almost 2 decades old. I first learned about Intelligent Transportation Systems (ITS) while I was a graduate student at UP Diliman taking up transportation engineering in 1994. The interest was stoked by more exposure to ITS when I studied in Japan later and participated in the ITS World Congress held in Seoul, Korea in 1998. I presented a paper at the congress and was able to go around to look at the cutting edge in technology at the time that was applied to transportation. I also learned that there were three big ITS organizations at the time – one in the US (ITS America), in Europe (ERTICO) and in Asia (VERTIS). I recall attending one meeting in 2002 when Dr. Ricardo Sigua, then on his second stint as Director of the National Center for Transportation Studies of the University of the Philippines Diliman presented the idea to a group that included then Department of Electrical and Electronics Engineering Chair Rowena Guevarra. The latter is now Executive Director of the Department of Science and Technology’s Philippine Council for Industry, Energy and Emerging Technology Research & Development (PCIEERD). At the time, the conclusion was that it was still premature for the Philippines to establish a formal ITS society considering that there were few who were actively involved in ITS research. I thought privately that people still had little understanding or appreciation of ITS and, at UP at least, we were not yet in an environment that enabled collaborative work among departments who are supposed to have the expertise to undertake ITS related research and perhaps be the core group for a society. Flash forward to the present, there is an ITS program currently being funded by the DOST-PCIEERD and under it are several research projects. One project is already underway and is being implemented through a collaboration among civil engineering (transport), electrical and electronics engineering and computer science faculty and students of UP Diliman. There are also several projects in the pipeline from Ateneo, DLSU and Mapua. These researches combined with various ITS applications with the private sector (e.g., electronic toll collection, variable messages, apps for commuting, etc.) means there is much more awareness nowadays for ITS and its benefits. This may also mean that the time is right and ripe for an ITS society to be established to further its applications. Dr. Ricardo Sigua of the UP College of Engineering presenting on the proposal for the establishment of ITS Philippines. On the forefront of the establishment of an ITS society in the Philippines is Dr. Ric Sigua, Professor at UP Diliman’s Institute of Civil Engineering and Fellow at the NCTS. He has been very active in ITS research and is currently project leader of the Philippines Manila Advanced Traffic Information System (PhilMATIS) project that is funded by the PCIEERD. Dr. Sigua has strong links with ITS Japan and is representing the country as observer in the regular ITS Congresses including the one to be held in Tokyo in October. During the ITS forum hosted by the NCTS in September 4, it was agreed that a core group will be established that will work towards forming a formal society. This will be led by the academe but will have the support of the private and government sectors. We look forward to what may be called ITS Pilipinas or ITS Philippines in the near future. With the proliferation of non-motorized transport (NMT) as public transport, there are questions raised pertaining to their regulation or management. Perhaps most pedicab, padyak, sikad or trisikad services around the country a regulated in some way. I use the term “some way” since there will always be either or both formal and informal rules for these services to be provided and patronized by people. These rules or regulations include the setting of pedicab fares that are most likely based on travel distance though not necessarily similar in structure to those of buses and jeepneys. Pedicab fares are practically similar to those for tricycles in that they operate within areas or zones. The rough locations of an origin and destination (i.e., rough distance between origins and destinations or distances between zones) would be the basis for fares. Private exclusive residential subdivisions or villages would have their own homeowners’ or residents’ associations. These will likely have a say in tricycle or pedicab regulations. Otherwise, many would probably have the power to restrict or prevent tricycles from entering and operating within the subdivision or village. Most if not all tricycles are organized as Tricycle Operators and Drivers Associations (TODA) and so might have some say or bargaining power when dealing with barangays or associations where many operators or drivers may be residing. In the case of pedicabs, there are also pedicab associations with similar compositions where operators or owners of cabs are residents of an area or village. In well-organized subdivisions, however, the associations hold sway over pedicab operators and drivers and enforce rules through contracted, private security staff. Pedicab rules are not very complicated. In fact, the rules can be provided or posted for every cab such as the example shown in the following photo. I took this as I was riding a pedicab to get home one afternoon. In the laminated reminder (paalala) to passengers, the fares as set with respect to the phases of the subdivision, which serve as zones of operation for pedicabs. There is a daytime rate, a nighttime rate and even rates for when there’s flooding along the streets! Penalties for pedicab drivers violating the rules are stated at the bottom of the announcement with four offenses resulting in a total ban of the driver. I assume the ban is also enforced by security and is aided by the fact that all drivers are issued IDs by the village homeowners association. In our neighborhood, the number of pedicabs operating at late nighttime to the early hours of the morning are regulated and there is a list of drivers providing services during these times of the day. This was a measure passed years ago in part to address the lack of public transport during the nighttime but more so to combat burglaries that involved pedicab drivers who might have become familiar with the routines of residents. These rules can easily be replicated and implemented elsewhere as long as residents are able to organize themselves. Perhaps in other cases they would also need to coordinate with barangay officials in residential areas where there is no exclusivity like that of a gated subdivision. That way, the rights and interests of passengers are well represented and can be articulated more effectively with respect to tricycle and pedicab associations who might just be exercising too much of their prerogative on passengers. After all, the interest and rights of passengers including their safety should be the priority here as in all other public transport because these are services being provided, and not just any business where revenue seems to be the only end. The Eastern Asia Society for Transportation Studies (EASTS) held its 10th conference recently in Taipei, Taiwan. I was supposed to go but another more important activity came up that required me to stay in Manila for the duration of the conference. It is my first time to miss an EASTS conference since I started regularly attending the conference in 2003 when the 5th conference was held in Fukuoka, Japan. Previous to that, I missed 3 straight – the 2nd held in Seoul, Korea, the 3rd that was also in Taipei, and the 4th in Hanoi, Vietnam. I learned from friends and colleagues that the 11th conference will return to the Philippines after 20 years for the 21st anniversary of the society. While the inaugural conference was held in Manila in 1995, the 11th will be in Cebu in 2015. This is an exciting development for the Philippines, especially for those in the field of transportation including researchers and practitioners. In the past conferences, the host country is presented an opportunity to present more academic and practical papers than what are usually presented by the country when the conference is held elsewhere and participation is limited due mainly to limited resources for travel and accommodations overseas. A friend posted a couple of images apparently taken from the presentation made by the delegation representing the Transportation Science Society of the Philippines (TSSP). I’m reposting these here as an early promotion of the conference in 2015. Logo for the EASTS 2015 conference in Cebu featuring the monument commemorating Magellan’s voyage that led him to the island in 1521. Tricycle and pedicab fares are set quite variably depending on the service areas and those regulating the services. In many cases, it is the pedicab association comprised of drivers-operators who set the fares, which are then supposed to be approved by local officials like those in the barangay or municipal/city hall. I say “supposed” here since most rates are not formally regulated in the manner like how the Land Transportation Franchising and Regulatory Board (LTFRB) sets fares for buses, jeepneys and taxis. While the principles of “willingness to pay” is applied to some extent, pedicab and tricycle fares are usually imposed (to use a strong word) by tricycle and pedicab associations with very rough estimates of operating costs or, in the case of NMTs, the equivalent of physical effort, required to convey people. In residential subdivisions or villages, associations may have a say in the fare rates. Where I live, the association sets the standard rates and these go to the extent of differentiating between day time and night time rates. There is even a rate for when streets are flooded! There is also a definition for regular and special trips and rates are according to the general distance traveled by pedicab. That is, fares to Phase 2 are generally higher than those for Phases 1 and 3 because Phase 2 streets are generally farther from the reference origin/destination, which is the village gate. 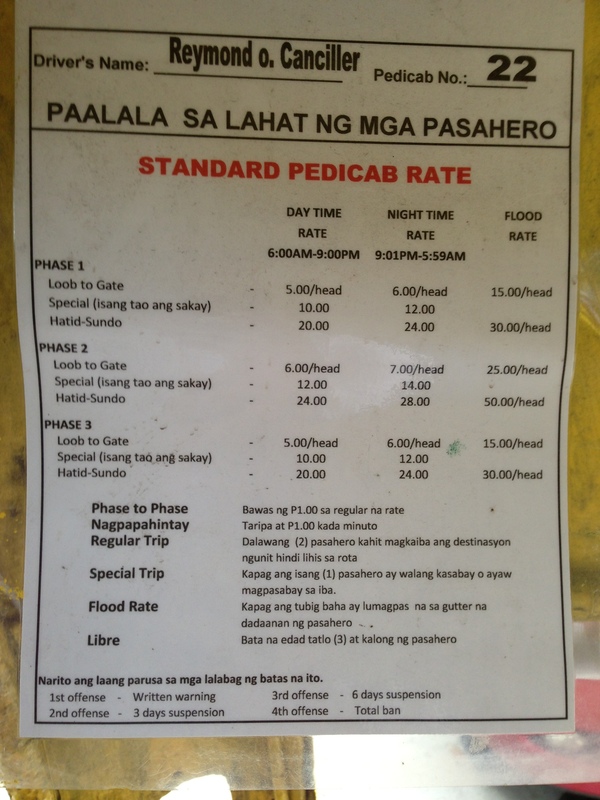 Given the effort of pedicab drivers to transport passengers, I think the rates are just right. The only part there that seems unusual is the rate of PhP 1/minute for waiting time, which to me seems to high. Nevertheless, there is nothing to stop passengers from showing their appreciation for hard work in the form of tips. And there is no limit to the generosity of some passengers who choose to pay more to the (pedi)cabbie. Tariff sheet displayed inside the sidecar of every pedicab of our village. The information is useful especially to guests or visitors who are not familiar with pedicab rates in the area. The flooding brought about by heavy rains around the country rendered many roads impassable to motor vehicles. This meant traffic congestion in many areas and so many commuters being stranded due to the lack of public transport vehicles available to them. In these times, the only modes for traveling are reduced and limited to walking and non-motorized tranport (NMT). While cycling is an option for some people, a more popular mode in many areas and local roads are pedicabs. Known by various names in the vernacular such as padyak, trisikad, sikad, etc., these three wheelers are found providing transport services particularly in residential areas. These tend to use national roads and busy streets in cities, and such often causes conflicts with motor vehicles as the NMTs slow down traffic. During times of heavy rains due to typhoons or the monsoon, pedicabs become the mode of choice for many who need to get to their workplaces, schools or home despite flooded streets. Photo of TV news report (GMA News’ 24 Oras) on air passengers taking pedicabs in order to get to the airport and catch their flights. Traffic was terrible due to floods along airport roads and only the non-motorized transport could navigate the flood waters. Interviews of passengers including tourists and foreigners showed their appreciation of the alternative mode of transport they had to take to catch their flights. Pedicab service along a flooded residential road – special rates are often charged by pedicab drivers during the rainy season and when go into flooded streets. Regulated fares are charged in areas like residential subdivisions where homeowners associations have a say in fare rates. In other places, fares can be arbitrary or according to the willingness to pay of prospective passengers. Bicycles are becoming popular for commuting not especially due to floods but more because of increasing fuel prices and fares. There is also an influx of second-hand or used bicycles from Japan (Note: Jitensha is bicycle in Japanese). These have become collectibles but are in actual use by their owners like the bikes shown in the photo that were exhibited at a mall recently.